Stoma abdominal belt for post-operative care after Colostomy / Ileostomy surgery. 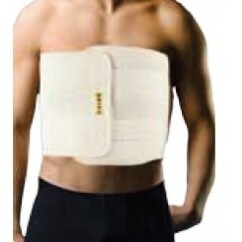 This belt provides hernia support and protection with strong even support for the abdominal wall. It is made from a stretch fabric with stabilizing ribs to prevent wrinkling providing a comfortable fit. The stoma guard provides additional protection from unwanted pressure around the surgery / hernia area. With Velcro fasteners for ideal and comfortable fitting. Breathable material with sweat management qualities. Place the opening around the operated area/ hernia, wrap the belt around your waist and fasten the Velcro fasteners as shown in the picture.